DUG Insight User ManualFrequently Asked QuestionsFrequently Asked Questions Installation and SettingsHow do I change Insight's default directory? How do I change Insight's default directory? 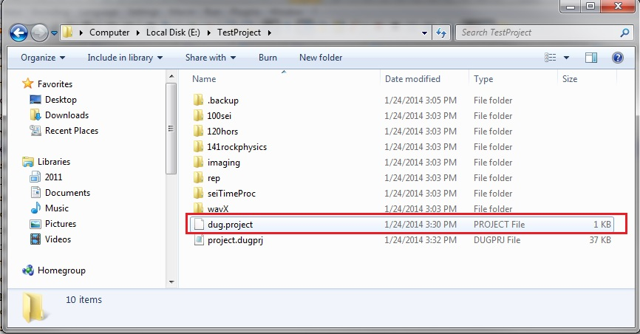 By default, Insight saves its data into the local project folder. If you wish to set a separate default location to save or load your data for convenience, you can change the default by following the steps below. Note: Please exit Insight prior to making any changes to the project file. Relaunch Insight after saving and closing the project file. Locate and open the project directory in the local disk. Right-click the dug.project file and open with any text-based editing software. Under directories, replace the folder names at the second column with the desired path surrounded by double quotes. When you are done, click on File and select Save. This will change the import/export/save defaults to the location specified. 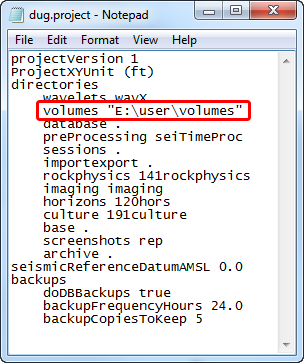 The example above changes the default path for seismic volumes. After editing the dug.project file, every time the user wants to import or export a volume, Insight will open the desired directory as the default. This just changes the default path; the user can still browse and save the volume at another location. Prev: How do I install Insight silently or via SCCM? Next: Why is exporting data from Insight light on CPU but heavy on RAM? Which Java version does Insight use? How does Oracle's Java licensing apply to Insight? How do I edit the Java's overriding Environment Variable? How do I install Insight silently or via SCCM? Why is exporting data from Insight light on CPU but heavy on RAM? Why is Insight running unusually slow? Why is my session taking so long to save? In Linux, why does Insight run out of memory for no good reason? How do I activate floating licence for multiple users? Why did my online activation fail? How can I see who is using the floating licences? Why doesn't my floating licence work, even after a successful activation? What is the best way to copy and send DUG my project database? How do I load sample data? How should I backup my project? Where is my user home directory? What is the "archive" directory? How do I sync my session across offices? How do I create "fake" source and receiver headers from offset values? How do I create a "chair" display in the 3D view using two different volumes? How can I created a layered result from many different input volumes merged at horizons? How to interpolate RMS values on a 2D horizon? How do I make an isopach or isochron map in Insight? How can I update a horizon to tie markers at wells? How can I calculate pseudo-impedance from seismic data? How to apply complex hand-drawn mutes to gathers and combine 2D results? How do I create a 3D Chair? How to estimate seismic bandwidth using spectral decomposition? How do I reverse the CDP to X/Y relationship for a seismic line? Why am I having issues loading SEG-Y? Which SEG-Y formats are supported by the SEG-Y Loader? How do I load multiple stacks or volumes from SEG-Y at the same time? How do I update restricted, locked, protected trace headers like offset, inline and cmp? My data loaded successfully. Why can't I see anything? Why is the 3D view not opening / giving errors / crashing? Why are there extra sections/lines showing up in 3D View, and how do I remove them? Views in Insight are zoomed all the way out, even when I click "Zoom to fit". Why is this happening? How do I display a horizon with its contours in 3D View? How do I pick contours in Insight? Why does SEG-Y Loader tell me I have a duplicate survey even though the coordinates are not the same? How do I change survey CRS to project CRS? How do I set boundaries for my 3D survey? Can I store a volume outside the project directory? How do I load a velocity ASCII cube into Insight? How do I crop a seismic volume using a polygon? How do I colour a volume differently between horizons? Why does the result of my Volume Combine process look different to my group of the same volumes? What should I know about Insight's 16-bit data compression? How do I merge lines from multiple 2D volumes and surveys into a single volume and survey? How do I gain a volume between two horizons, using a spatially varying multiplier? What are some good ways to create synthetic velocity models? How do I create a velocity model from time-depth (T-Z) pairs? How do I use a velocity volume as time-depth conversion at the well? How can I create a simple velocity model for 2D data? How do I create a velocity gradient volume? How do I create a contact horizon for use in layered models? How do I perform an amplitude extraction at different angles through the volumes? Why is the amplitude value as shown by the cursor different than the horizon extracted value? How do I decimate an interpolated surface back to its original picked lines? How do I extract the number of events between 2 time horizons? How do I perform an amplitude extraction between two horizons? How do I dynamically update an Isochron Map? How do I pick events on absolute impedance and other non-zero mean data? How do I export a time-slice as an X, Y, Amplitude map? How do I import or export faults? How do I load well data? Why can't I see my well in section views? Where does Single Well View extract 2D value from? How to export map values at specific IL/CL locations? How do I find out the area and volume of a polygon? How do I convert culture polygons into regular polygons? How do I convert a .duculture file containing many shapes to a .dupoly file? What is the best way to crossplot the points in a series of channel structures? How do I filter large amplitudes, extreme values and spikes from my data? When should I choose a Dip filter over an F-K filter? How do I scale synthetic trace relative to seismic? How do I find the RMS amplitude for a single trace over a given time window? How do I do this with a synthetic? Why does the amplitude spectrum not show deeper peaks and troughs as expected? Why does my Kingdom survey appear with a different spacing in Insight? How do I import a Kingdom polygon to use in Insight? How do I send the Petrel message log? How do I export polygons from Petrel to import into Insight? How do I manually remove the Petrel Link? How do I send horizon attributes / amplitude extractions to Petrel? Why is the Petrel Link showing me a different project after connecting? How do I transfer an on-the-fly horizon to Petrel? How do I transfer depth-converted faults to Petrel? How to upload to our FTP server? How to download, unzip and load volumes and surveys into Insight? How do I get my data stored in a third-party database into DUG Insight? Where are the old Insight user manuals? Where can I find the manual for older versions of the software (e.g. Insight 3.1)? I have a great idea for Insight! How do I send DUG my suggestions? Display driver has stopped responding. What should I do? Installation of Insight failed! What should I do? There is a problem. How do I provide information on my issue? Help, Insight just crashed! What should I do now?